Shona finds a DVD on the doormat and is horrified to discover someone filmed them whilst they slept. Clayton tells her the prison bullies were behind it and she needs to help him or they will be after her. Shona is cornered by two thugs in the barbers shop will she agree to their demands? Nick walks in and demands to know what is going on. A loved up Abi has spent the night at number 4 and is clearly loved up. When Peter tells her that Nick and Gail want the boat moving and a mate has offered him a sailing gig in Kefalonia in a fortnight and he’s going to accept she is gutted. 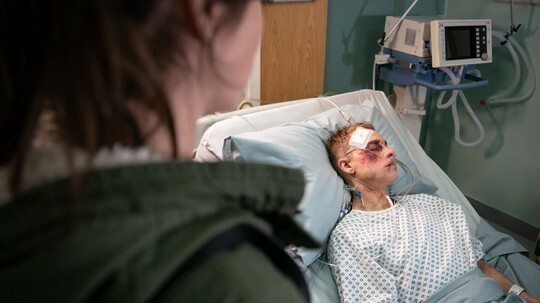 Carla is shocked to find Roy sleepwalking in the street and advises him to go and talk to someone as clearly his mum’s death has brought this on. Meanwhile, Johnny and Jenny return to find the pub in a state of disarray and Chesney and Gemma locked in the cellar. Emma’s appeals for some more shifts fall on deaf ears. Nick follows Shona and is intrigued to see her take a parcel off the two thugs in a street. Nick confronts her and asks her what is going on. Upset at Peter’s plans to take off Abi hits the bottle and lashes out at Carla for keeping Peter dangling and unable to move on. Seeing how upset she is Peter suggests she could come with him. Carla despairs to find Roy pouring over the inscription on his mother’s ring yet again. Carla enlists Brian’s help in a bid to unravel the mystery of Roy’s mother’s ring. Elsewhere, as Tyrone struggles to juggle work and parenthood, Dev has an idea and sends Mary to the rescue. Gemma puts pressure on Jenny to give Emma a job, Emma’s thrilled. Simon is furious that Peter is taking Abi sailing, causing Peter to say he can come instead as Abi means nothing to him. Seb overhears this, will he tell Abi? Shona gets a call to say Clayton has been beaten up in prison and rushes to the hospital. Meanwhile David starts smashing mirrors then corners Nick in the barber shop and demands to know exactly what is going on. Roy admits he’s having trouble sleeping. Carla’s concerned for him. Realising that Roy is too tired to concentrate, Carla manhandles him up to the flat. As Carla tidies away Sylvia’s belongings, she notices that Roy’s fallen asleep on the sofa. Finally, Kevin finds an activity holiday for Jack. Mary tells Tyrone she doesn’t want paying for helping him she just likes to feel needed. Gemma’s idea of making tea for Chesney and Joseph doesn’t go quite to plan when she burns her hand and swears in front of Joseph. 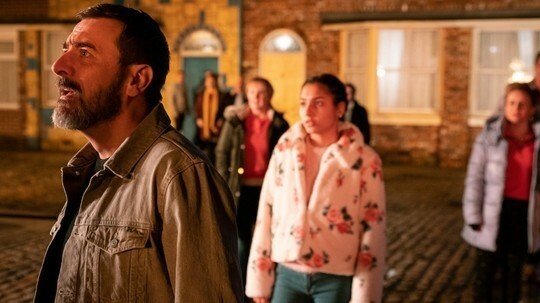 A furious Abi lashes out at Peter for his treatment of her and heads off to get drunk, Peter tries to reason with her that alcohol isn’t the answer but she gives him short shrift. Meanwhile in the boat Simon is showing Aadi and Asha round using a hurricane lamp he has lit. Leaving Simon on the boat Aadi and Asha extinguish the lamp and go home. But in the darkness someone knocks over the lamp and the smouldering wick ignites. A crowd gathers round the burning boat as Aadi and Asha tell Peter that Simon is still on board. Will he rescue him in time? Furious Peter goes in search of Abi certain she started the fire as a drunken act of revenge. When Clayton tells her that he wishes she’d died rather than his Dad, Shona’s crushed. Having forced the information from Nick, David confronts Shona wanting to know why Clayton was beaten up. Shona plays it down and keeps schtum about the drugs. Adamant that she’s happy to babysit, Mary insists Tyrone and Kevin head out for a few beers. When she offers to pop a hot water bottle in Tyrone’s bed for his return, Tyrone’s touched whilst Kevin reckons Mary fancies him. 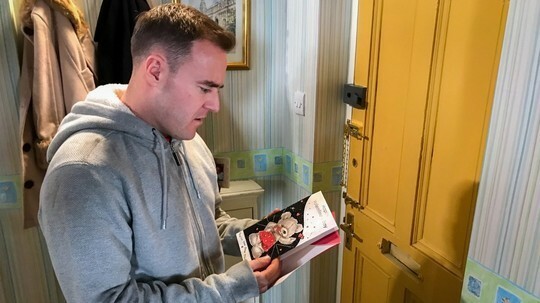 Having thanked Mary and bid her goodnight, Tyrone’s horrified to discover a Valentine’s card on the mat. When Joseph refuses to go to bed, Chesney threatens to ban any telly for a week. Joseph fires Gemma’s swear word at him and runs upstairs. Chesney’s shocked. 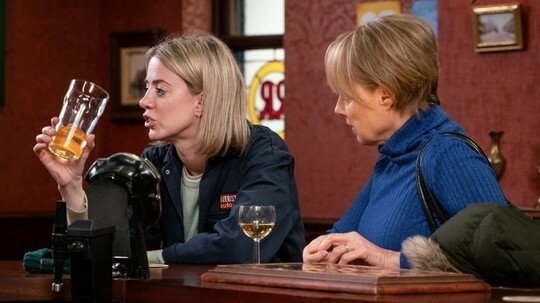 Chesney berates Gemma for teaching Joseph a swear word. The evening ruined, Gemma heads off in a strop. Abi arrives back from a night out and angrily denies any part in the boat fire. Peter is still disbelieving and asks Carla to check the CCTV from the factory to see if it throws up any clues. When the police arrive to check the CCTV footage Sarah is surprised to see the past few days footage have been deleted. Is Carla hiding anything? When Tracy quizzes Amy about her 12 week scan, Amy lies, making out she’s heard nothing from the hospital. Despite her morning sickness, Amy sets off to school. Having searched Amy’s room, Tracy finds a letter from the hospital and realises Amy’s been lying to them. Steve and Tracy show Amy the letter and assure her they’ll support her whatever she decides to do, but they’re interrupted by the arrival of Vicky. In a bid to make up for the previous evening, Chesney springs a Valentine’s surprise on Gemma in the kebab shop, but it all goes pear shaped again. Vicky persuades Robert to give Tyler a job washing dishes at the Bistro. Tyrone is worried the mystery Valentine may be from Mary. Brian and Roy set about searching local records for info on the ring inscription. When Peter hears from Sally that the CCTV footage has been deleted and Cathy confirms he saw Abi across town at the time the fire started Peter decides Carla has some explaining to do. He storms round to Roy’s flat and accuses her of setting fire to the boat. Carla denies any involvement and Roy leaps to her defence. Amy is horrified when Vicky says Tyler is sorry for the way he behaved and wants to be part of the baby’s life. Steve and Tracy take Amy for dinner at the Bistro and are disgusted to find Tyler working there. Playing detective Tyrone and Kevin order some flowers and ask Mary to write the card for them. Tyrone is horrified when the writing matches the one on the Valentines’ card. Meanwhile Chesney and Gemma get saucy in the kebab shop!